Today it was really warm (about 22ºC) so we decided to take a walk and head for Maremagnum (don´t miss this link to see a panoramic view and much more) , a combination of shopping mall and leisure center including the aquarium, imax cinema, and lots of restaurants and disco bars on the very edge of Barcelona's Port Vell ("old harbour") waterfront. Standing on the planks of the wooden platforms by the sea you can take pictures like this. Great shot Carlos! This one is so different to the past few. Something stunning in its stark simplicity. Wow - what a super picture - you got the boardwalk and the bay in the windows! 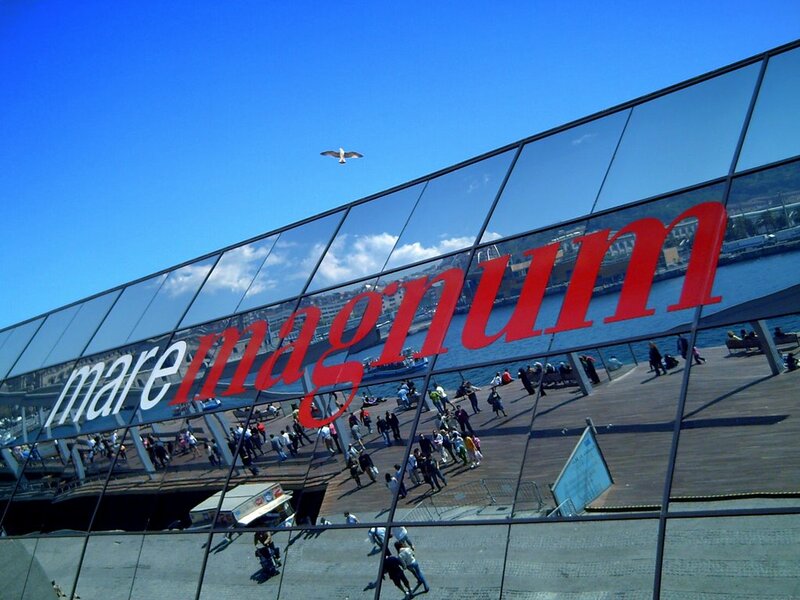 I clicked the link and spent a few minutes as a tourist in Maremagnum - great place to spend a day I bet. Wow. Love where it is, right in the bay. Great shot! Love to see everything through this reflection. And the seagull adds as a little dot to the i :). I was there on Friday - the bridge was being repaired. I always liked the cool pictures you can take focusing on the mirrors. The reflections are just great, just like that one.